Care providers warn that growing staff shortages mean vulnerable people are receiving poorer levels of care. In a letter to the prime minister, the chair of the UK Homecare Association says the adult social care system has begun to collapse. The government says an extra 2bn is being invested in social care. 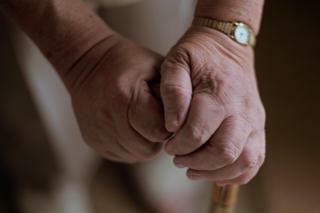 An ageing population means demand is increasing for adult social care services. Those who provide care to people directly in their own homes, or in nursing homes, say a growing shortage of staff means people face receiving deteriorating levels of care. 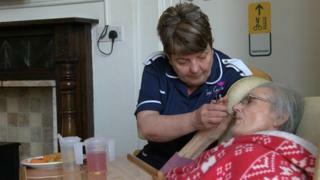 “You just can’t provide a consistent level of care if you have to keep recruiting new people”, said Sue Gregory, who has been a care home nurse in North Yorkshire for 13 years. Data gathered by the charity Skills for Care, shows that in 2015-16 there were more than 1.3 million people employed in the adult social care sector in England. An estimated 338,520 adult social care workers left their roles in 2015-16. That is equivalent to 928 people leaving their job every day. The average full-time frontline care worker earned 7.69 an hour, or 14,800 a year. One in every four social care workers was employed on a zero hours contract. There was an estimated shortage of 84,320 care workers, meaning around one in every 20 care roles remained vacant. The figures show that social care providers are struggling to retain their staff, with the industry having a staff turnover rate of 27% – nearly twice the average for other professions in the UK. “This is not the job I’m going to be doing for the rest of my career” said 25 year old Trudi Hewitt, who works at a care home in Scarborough, North Yorkshire. “I really care about the people I look after, but I just feel that the care sector is a dead end job”. The government has recently committed to spending an extra 2bn on the social care system, and allowed local authorities to raise council tax bills in order to fund social care services. The number of people aged over 75 is expected to double by the year 2040, according to the Office for National Statistics. Those trying to provide social care services say without radical change, there will not be enough people to care for an ageing population. 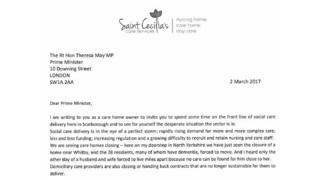 In a letter to Prime Minister Theresa May, Mike Padgham the Chair of the UK Homecare Association said: “My biggest fear is that we will soon run out of capacity to provide care to those who cannot fund themselves. Image caption As chair of the UK Home Association, and an owner of a care home, Mike Padgham has written to the prime minister to warn of the pressures on the social care system. Downing Street said it thanked Mr Padgham for his letter. A Department of Health spokesperson said: “Social care jobs have increased at an average of 3 per cent a year since 2010, but we want to see improvements in turnover rates, with talented staff attracted to a robust sector backed by an additional 2bn over the next three years.